Boy Novak finally gathers up the courage to escape her tyrannical rat-catcher father and the cold loneliness of New York City. She finds a small town, a job, and a handsome widower to love. Boy marries Arturo and becomes part of a long-established family and stepmother to a beautiful little girl named Snow. But when Boy gives birth to her own daughter Bird, she discovers that the Whitmans have been keeping a big secret. Tension builds until Boy makes a choice that will forever change their family. Boy, Snow, and Bird must confront their most closely held beliefs about themselves and each other. Boy, Snow, Bird is marketed as a Snow White retelling and in a sense, it is that. At a very basic level, Boy becomes the wicked stepmother when she finds her loyalty divided between her own daughter and the daughter of another woman. But this book is so much more than that. Oyeyemi looks at racial, gender, and familial identity through a very unique lens. She also grapples with questions of beauty and perception. This is seen most strikingly through the Whitman women and their interaction with mirrors. Boy very much enjoys looking at herself in the mirror. Snow does sometimes, but worries that she can't see her reflection at certain times. Her half-sister Bird discovers that she rarely has a reflection - she can't be seen by herself or other people. This story focuses heavily on the things that aren't done or said. It is one of those stories where not much seems to be happening, but everything is happening to these characters in small, quiet moments. Fairy tales and their retellings can be difficult because we get seemingly one dimensional characters, moments of magic next to moments of real life, and sometimes inexplicable plot points. That is certainly the case with this book. Oyeyemi has a very distinct writing style and I found myself intrigued for much of the story. Towards the end, though, she reveals something very crucial which left me scratching my head. It just felt incredibly out of place as if the author decided that this thing should happen, regardless of whether or not it fit with the tone or plot of the rest of the story. 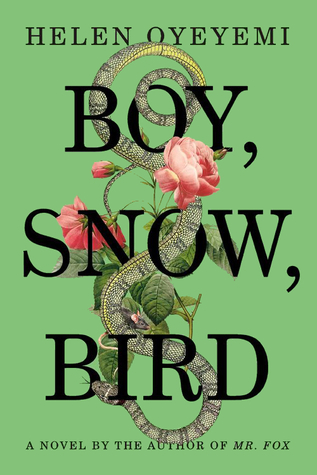 Boy, Snow, Bird is a novel that is difficult to describe. Whether you actively enjoy it or not, this book is one that begs to be considered, to be re-read and to be thought about as the author subtly raises questions and leaves you to answer them. The writing is captivating and this is a story that demands to be noticed. I struggled SO MUCH with this book, but that's more my fault than the author or plot's fault. I wanted the book to focus in a more straightforward way with passing, and it just didn't. I will definitely try more of Oyeyemi's work but with fewer preconceived notions. I feel like I wanted more on several levels. I wanted to know more of the character's thoughts and I wanted some time to get to know Snow and Arturo, for that matter. I really loved Oyeyemi's Mr. Fox and I don't remember having the same issues with it that I did with this one.